Added to this is the latest onslaught by the State to kill, torment and harass innocent Zimbabweans in a tragic move that only goes to show that contrary to the much-vaunted mantra, this is not in any way the second Republic but a heinous continuation of the brutal first regime post-independence in 1980. Several organizations including the Catholic bishops have produced reports on the current disturbances. The Zimbabwe Human Rights Commission, in line with its constitutional mandate, has since pronounced itself on the recent violence and held the State liable. At this rate, the situation in the country can only get worse unless and until there is urgent intervention to avert the Zimbabwe crisis. The events in context Our sympathies are with Zimbabweans who have in the past weeks experienced a throwback t the darkest days of Rhodesia or incarnated an apartheid Zimbabwe where armed personnel descended on communities, indiscriminately dragging men and women, boys and girls out of the privacy of their own homes to brutalize them without cause. We reiterate the importance of peace and non-violence. This is a cardinal principle which has always been the foundation of our glorious movement. The events and protests over the past weeks were self-evidently triggered by an ill-thought announcement of fuel price increases made by Mr. Mnangagwa. This came hard on the heels of the 2 October levy on e-transactions which adversely affected the people. This resulted in citizens being vulnerable, feeling betrayed and undermined by anti-people policies and anti-poor measures. The people of Zimbabwe are therefore facing an existential threat. Zimbabweans need a country where dignity, security and opportunity are guaranteed as an absolute entitlement. Hardship knows no party and therefore the challenges facing Zimbabweans are neither MDC now Zanu PF. For that reason, all State institutions must perform their constitutional duties to serve and secure not to destroy and threaten. Our army and police must protect and not terrorize. No citizen must feel vulnerable on account of excesses in the behaviors and conduct of the State. Citizens must be free. The government must not be feared. No single Zimbabwean must walk in the country or go sleep scared of being harassed or brutalized by the State. No Zimbabwean must be embarrassed in communities or before their own families. No Zimbabwean must be killed by the government. No Zimbabwean must get injured or maimed on account of holding a different opinion. Over the past few weeks, many Zimbabweans have been subjected to human rights abuses, violation of fundamental freedoms, crimes against humanity and internal displacements. Many have been subjected to dehumanizing and life threatening brutality and injuries. This raises serious questions about our values and morals as a nation. The sanctity of human life is not being honoured. The culture of violence dates back to the 1980s and 1990s where traumatic State orchestrated episodes of gratuitous violence was visited upon the citizens. I know many of you have an eye witness account and personal stories to tell about what has happened. We note with serious concern the attempted arson of the MDC national headquarters and the on-going annihilation of the MDC structures and leadership. There has been a serious attempt to decimate the MDC as evidenced by the targeting of its leadership including elected Honourable Members of Parliament and councilors as the regime moves to hold the people’s party liable for what in essence were the actions of an angry citizenry demanding that government finds a lasting solution to the burgeoning political and economic crisis. The response of the State has been brutal; deploying armed soldiers to kill and maim and targeting some citizens who had retreated to their homes by indiscriminately assaulting them. Others in areas such as Epworth have reportedly been raped by agents of the State while those picked by the State have been denied bail by the State, pointing to a deliberate ploy to cow and intimidate the citizenry in this de-facto state of emergency. There has been a sustained vilification and attack of the MDC, a legitimate political party especially by government leaders and the State media. The blanket curtailment of basic freedoms in the country has led to a situation in Bulawayo where the party failed to hold its primary elections to select a candidate in preparation for the by-elections in Cowdray Park. There is fear and trepidation across the country as agents of the state continue to cow the nation, randomly targeting innocent Zimbabweans and assaulting them. The human rights situation in the country has simply reached a crisis level. The human rights violation statistics It has been difficult to collate figures and specific names due to circumstances of emergency in the country where more than 12 people have reportedly been killed in the past one-and-half weeks. Some of the 12 casualties include Kelvin Tinashe Choto (22) of Unit A, Chitungwiza, Abraham Nyapokoto (35) of Mbare, Trymore Nachiwe (22) of Glen View, Solomon Nyaruwa (49)of Marondera who was buried in Chimanimani, Thandiwe Ncube, of Epworth, andTinashe Kaitano of Kadoma, Tafadzwa Katare (22) of Kuwadzana and Kudakwashe Kapandamurongo (22) of Mbare. There have been killings of a police officer in Bulawayo and other innocent citizens in Sizinda and other areas. There have been 844 reported human violations and 78 gun-shot injuries, according to the Zimbabwe Human Rights NGO forum even though the figures keep rising every day. At the last count there were well over 1 000 arbitrary detentions in Harare, 28 in Mashonaland central, 41 in Midlands South, 395 in Bulawayo, 138 in Chitungwiza and 53 in Manicaland while the figures continue rising while the figures for other areas are still being captured. More than fourteen women were allegedly raped by armed people in Harare South and Epworth. Some of our elected councilors who were arrested include Elvis Ruzani and Munyaradzi Kufahakutizwi, Simbarashe Nyahuye and Charles Ngenya in Marondera, Epworth ward 5 councillor, Elias Sithole and Kadoma councilor Michael Gore. Just today and a few days ago, there have been property demolitions in Chitungwiza and Mbare targeting hard working Zimbabweans who are trying to eke an honest living. Civic bodies indicate that more injuries are being recorded on a daily basis especially at night. 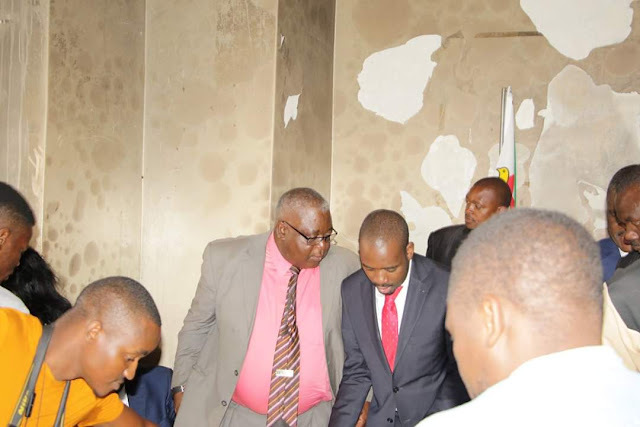 The MDC is still compiling a comprehensive list of its supporters who were being harassed and were caught in the crossfire as the government mounts a crackdown on a legitimate political movement. Also arrested were Honourable Members of Parliament including Hons’ Amos Chibaya, Settlement Chikwinya, Livingstone Chimina, Rosemary Nyathi and Lloyd Mukapiko while about 43 MPs have either been harassed or are being harassed with their lives in serious danger. Members of the party’s staff have also been targeted with some being assaulted. Regrettably, the State is in denial. Instead of showing accountability and taking responsibility, some in the State have manufactured a list and catalogue of falsehoods, scapegoats, excuses, justifications and convoluted explanations. It is necessary and urgent for us to plot a way out of the current crisis which has led to a far worse humanitarian crisis with devastating consequences. The State has alleged that protesters who exercised their section 59 constitutional right to protest peacefully engaged in violence, looting and destruction of property. But tellingly, protesters accused of violence, looting and destruction of property are being routinely charged with treason and/or seeking to overthrow a constitutional government. The difference is between day and night. People are accused of one thing but they are charged of another. This is absurd. The desperate and embattled authorities want to eat their cake and keep it at the same time. This must stop. The Nature of the Crisis The crisis in Zimbabwe is a crisis of governance. It is a crisis of leadership which is inherently political in nature and character but manifesting itself economically. The political crisis draws its roots from a toxic political environment and a perennially flawed electoral process. It is trite that authority to govern derives from the people. It is the people who confer legitimacy upon a government. They do so through free, fair and credible elections. Unfortunately, for years, our flawed electoral system has failed to deliver legitimacy to govern. Consequently our beautiful nation has remained stuck in the Dark Age, isolated and ostracized. The fabric of politics has been characterised by suspicion, fragmentation, deep division, palpable mistrust, accusation and counter-accusation. Our governance foundations are ruined. Our leadership roots are rotten. Our base of values is shaken. In this regard, we have held out a hand of dialogue but it has been spurned and disrespected by our counterparts in Zanu PF. It is not because we are desperate in pursuit of power. It is not because we covert the seat of authority. It is because we care for our beautiful country and the ordinary loving people of Zimbabwe whose plight grows with each day that passes. The economic effects of a stolen election, disputed election result and political instability are evident for all to see. To heal the economy, we must heal our politics. To fix our economy, we must repair our political fabric and moral fibre ringing about a revolution of values and culture to respect the sanctity of human life and the dignity of humanity. Without doubt, the political crisis has also had catastrophic social effects, leaving the weakest and most vulnerable members of our society falling on hard times. To all fellow Zimbabweans, we in the MDC respect and emphasise the constitutional principle that authority to govern derives from the people. This is in terms of the Constitution which forms the foundation of the social contract between government and the people. The people must never live in fear of their government. They must stand firm in defense of their rights, freedoms and the Constitution. The government must respect and honour the people because without them there is no authority to govern. To the State, there must be a cessation of lawlessness and break down of the rule of law. Lawlessness must be reversed. There must be affirmation, respect and observance of the Constitution. We must re-establish and re-entrench civilian police mandate to keep peace, law and order, taking our troops off the streets and the villages. Zimbabwe needs an urgent return to and restoration of constitutional rule, civilian administration and the rule of law, harassment of prisoners of conscience and release of political prisoners. Equally, our security services’ constitutional role in defending the country is unreservedly acknowledged. The role of our security must be performed professionally and in accordance with the law. There is no room for impunity and immunity. Individuals who are violating human rights are contravening the Constitution and international treaties and conventions on human rights. They also are doing intolerable damage to the reputation of these key national institutions of both the police and the army negating the citizens confidence in the same. Many have been abducted whose whereabouts remain unknown. Some have been tortured and raped. Internal displacements and damages to properties and homes in the high density areas have become rampant. Beatings have become a daily diet, with assaults being a routine dose. The challenge is that the full extent of these atrocities remains unknown. It is crucially important that there be a neutral, fact-finding mechanism process which is multilateral and judicial so as to determine the full extent of the atrocities that have been committed against the people. The notion that the very authorities alleged to be responsible for the atrocities should also audit the extent of these atrocities is unacceptable. It is irrational and inhuman to expect perpetrators to audit victims. It is equally irrational to expect the perpetrators to hold themselves accountable. The human rights situation now obtaining in Zimbabwe requires the appointment of a special UN rapporteur on Zimbabwe to ensure accountability. To our brothers and sisters in the SADC region, we say this is the time to stand with the peace-loving people of Zimbabwe. This not the time to see no evil, hear no evil and speak no evil, burying heads in the sand while a human rights crisis escalates into inordinate levels. How many people must die or be killed before a firm and principled stance against atrocities being committed in the country is taken. How much blood must flow on the streets before the eye and hand of the region is drawn to this dire situation. Our concern is that in spite of the letters and communication we have sent to SADC and the AU, they have remained mum in light of a precarious human rights situation in the country and an onslaught on a legitimate political movement in the country. We urge SADC and the AU to show solidarity with the people of Zimbabwe by stopping this heinous onslaught on the country’s citizenry and facilitate dialogue to resolve the political stalemate I the country. Lives have been needlessly lost while innocent Zimbabweans have either been needlessly assaulted or are seeking refuge in the mountains for their safety. We urge urgent action to be taken in Zimbabwe to deal with the economic crisis, the humanitarian situation and the critical matter of a government that has become a grievous danger to the citizens. In a situation where party leaders and innocent members of parliament are being targeted, no one is safe. We call for the National Peace and Reconciliation Commission to institute a healing process that involves compensation, psycho-social support and rehabilitation of State sponsored violence. We call for the world to turn and train its eyes on Zimbabwe and to empathize with the innocent citizens undergoing a brutal onslaught with no prospect of respite on their plight. We urge the world, particularly our own SADC and the AU, to stand with the people of Zimbabwe and not with the Zimbabwe leadership. On our part, we shall not despair. The people are sovereign and ultimately, the people shall govern.